Within each of us lies our center, a vortex of truth. Years are spent in the labyrinth of living, looking for the passageway to guide us in. We reach the apex of our journey when we clearly see—there is no return, but on the path that led us out. Every person in the 'awakening' process follows the 'bread crumbs' appearing before them in an attempt to find their soul's path. Creating and maintaining the Prairie Labyrinth made my path visible, catalyzing the merger of my inner and outer purpose. The art of living is the art of changing directions. A labyrinth imitates Life's journey taking us through reversals or constant turning points, but the single-path design ultimately returns us to our center. It provides a direct passageway to enter the NOW, bringing us into the present moment. The Prairie Labyrinth is a living ecosystem that changes every day, reflecting our own cycles of evolution. This is especially apparent when the weather or seasons change. The labyrinth is a safe place to practice and assimilate inner and outer changes. You may think you walk a labyrinth to find your balance within the world but, in the stillness, you allow the world to find its balance within the Self. Labyrinths appear to be stationary, yet are actually multidimensional portals serving to remind us that we are mobile, human portals with direct access to an ever-expanding, flexible network of Light. Just by moving through a labyrinth, we release the dross we have accumulated while coming back into alignment with the planet's rising vibrations. Toby Evans has been practicing earth stewardship on property near Kansas City, Missouri since 1987 when her husband initiated a prairie restoration project on their land by planting warm season grasses in 5 acres of an existing soy bean field. The project evolved from a network of paths cut around the perimeter of the prairie to constructing and maintaining a single-path labyrinth in the center. A Classical Seven-Circuit pattern was mowed into the grass on March 23, 1995, installed by Toby and Mary K Barge. It is called The Prairie Labyrinth. More than a walk, these are energy sessions for individuals or groups geared to "quiet the mind, calm the body and stir the spirit." The Labyrinth provides a sacred container for reflection, relaxation, release, and renewal. It is also used as a potent portal, assisting earthbound souls to cross over to the "World of Light." Labyrinth experiences or transpersonal workshops at the Prairie Labyrinth can be tailored to fit your group. A guided induction to introduce you to the Prairie Labyrinth precedes your personal time on the paths, which includes the Prairie Labyrinth as well as walking Chante Ishta, the 9-petal Vesica star pattern. Your energy field (aura) will be measured with dowsing rods before and after walking, providing visual feedback of your system's response to the Labyrinth's energy. If you have already visited the Prairie Labyrinth and want to return to have your own unassisted time, the cost is a love offering/donation of your choosing. Appointments are required. The Prairie Labyrinth is set up in the order of your Chakra system with fence posts placed at each of the turns creating "Chakra Stations" which identify the Chakra path you are on. Chakra Labyrinth Cards, designed to be read at each of the turns, are available to deepen and enhance your walking experience. They can also be purchased and used with any labyrinth or as a personal meditation tool. The labyrinth is open from April through November by appointment only. If you desire a winter experience, please inquire. 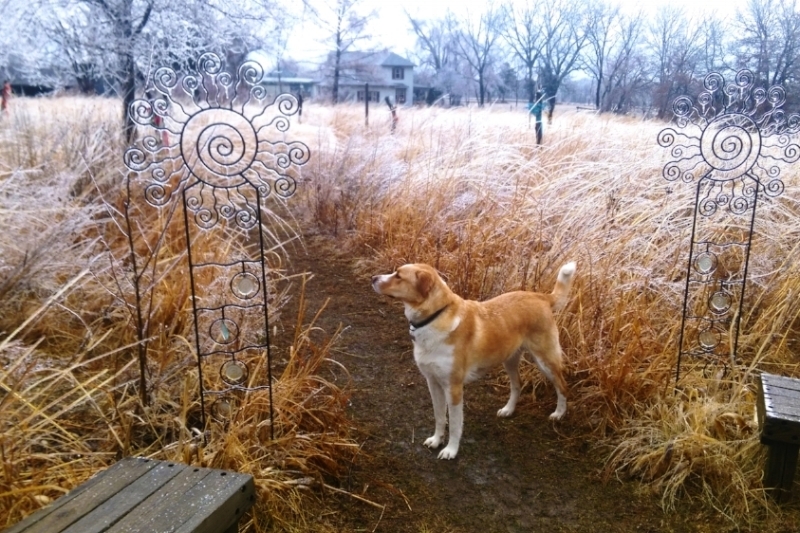 The most exciting part of maintaining the prairie grasses is not mowing the paths or hand pruning the grass (a routine part of the regular upkeep done throughout the growing season). 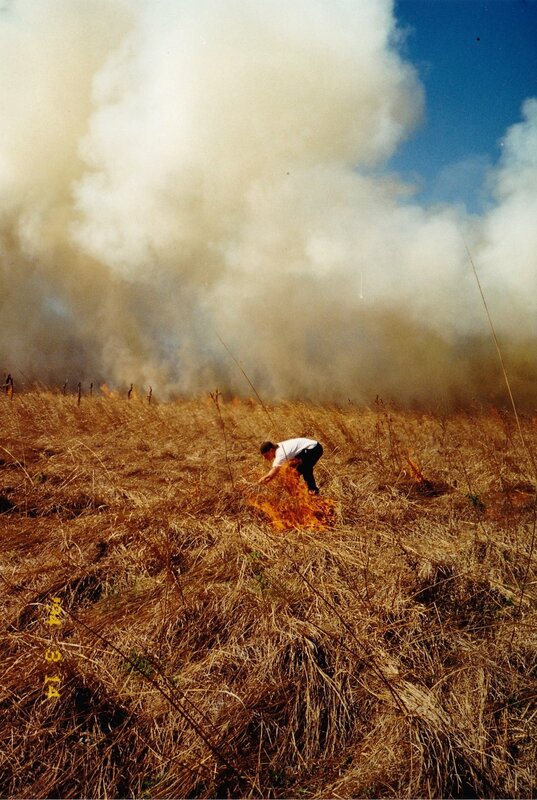 The high octane excitement comes when deeper maintenance requires a controlled burn every 2-3 years to help clear old dead grasses and accumulating weeds. A burn is done in the spring of the year taking advantage of the fire to help jump-start growth of new seeds beneath the soil. A controlled ring-head burn is accomplished with two ignition and containment teams moving in opposite directions around the circumference of the land. The fire is directed toward the center allowing the labyrinth to be the last area to burn. When the burn is complete, the labyrinth paths remain visible in the field. This is the only time the entire pattern is clearly revealed, (the way other labyrinths usually look). Burns have been occurring since 1995 and are the best part of prairie maintenance. Participating in a burn is a memorable experience that is open to anyone who is drawn to help. If you want to be notified of upcoming burns, sign up on my mailing list.